WT Architecture is looking for a talented and enthusiastic Part I architecture student to join our busy practice in early 2018. Our work is overtly contemporary but engages directly with the historic urban and sensitive landscape settings in which we regularly work. Current projects include a wide mix of bespoke private houses and extensions, independent commercial enterprises, grass-roots community schemes, and high-profile public buildings. The position requires the ability to work effectively as a team member in a fast-paced environment, assisting project architects on active projects as well as taking responsibility for general office administration. Candidates should be highly computer literate and be proficient in digital design packages including 2D CAD, Photoshop and InDesign, SketchUp and/ or other 3D modelling systems. Some experience working with 3D CAD (BIM) platforms such as Archicad or Revit would be preferable. A flood of new projects have appeared in the start of 2017, the largest amongst them being an opportunity to redevelop a vast ruined steading complex in East Lothian. We are delighted to have been appointed as Architects and lead consultants on this project, which will seek to bring a mix of new private and public uses to this stunning but neglected building. In late February we will be on the spectacular isle of Jura to start work on a new project for a new on the eastern coastline. We are thrilled with this latest appointment and look forward to developing a contemporary building befitting the remarkable character of this island. A sneak preview of a new project we have been working on recently for the alteration and extension of a townhouse in Elie. Its great to have the opportunity to work in this location again after the success of our beach house a couple of years ago. We very much look forward to developing this project further through the winter. The WT Architecture family has expanded a little over the summer! Warmest congratulations to Susie and on the arrival of baby Arthur, and to also Lucie on the birth of her little boy Tobias. Our conversion of a ruinous steading building near Gullane in East Lothian has recently edged over the line to deserve being called 'complete'. A modest and reserved architectural intervention into a collection of historic buildings, the focus of this house project was on appreciating and complimenting the beautiful south-facing walled garden. WT Architecture are on Instagram! WT Architecture are now on Instagram as @wtarchitecture. Head over and 'follow' us receive visual updates on exciting new projects, on-site progress, as well as various other things that take our fancy. We have always been lucky to work on some wonderful projects at WT Architecture, but sometimes we get to work on projects we really wish could be our own. We have recently been developing some initial designs for a small private bothy on a secluded and inaccessible loch-side location. 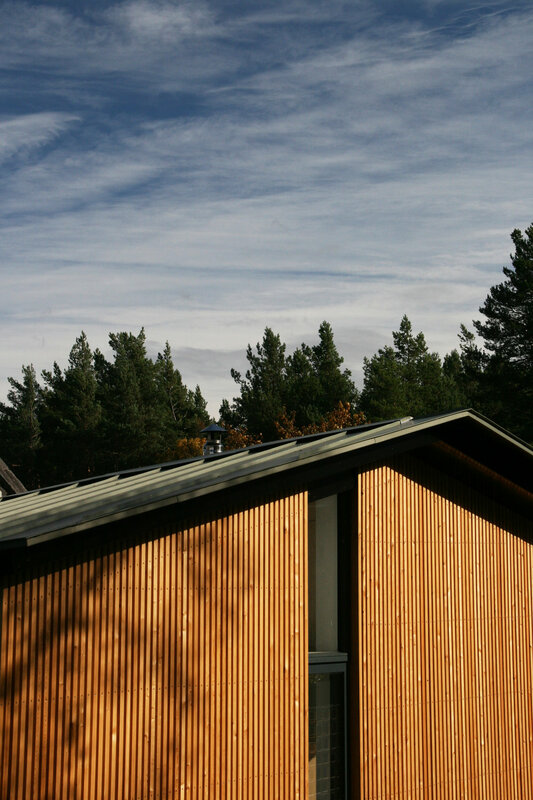 This modest building will be a place for our clients to retreat to with their friends and family, enjoying canoeing in the summer and evenings of whisky and fireside chat in the winter. Although an apparently simple structure, the building responds very carefully to the topography and orientation of the site, the position of trees and the directions of key views. The simple timber structure will be cloaked in black timber cladding and metal roofing, whilst the interior will be whitewashed. Four sleeping areas are provided, a stove for warmth and cooking, and practical bench seating and countertop furniture. We have secured Planning permission for a new house near Newport upon Tay, overlooking the Firth of Tay and across the water to Dundee. The house is positioned in a gently sloping parkland setting, against a backdrop of trees, sinking slightly into the slope. On approach the house is overtly closed down and private, and built up in stone reclaimed from nearby ruins. On the other side the house is more open and luxuriates in the open views.